Despite the announcement from Cannon Films that Superman V was in Pre-Production as early as 1988, the project’s failure to materialize due to the collapse of the Cannon Group meant their option had reverted back to the Salkinds. With a first draft provisionally titled ‘Superman The New Movie‘ taking the saga back to its science-fiction roots (incorporating the City of Kandor and Brainiac as the villian) the project was intended to be the Salkinds next once they had completed Christopher Columbus: The Discovery. With buzz already circulating due to Alexander Salkind turning up to Europex courting investors (see third pic down) and rumours (confirmed by Salkind, Bates and Later Reeve himself) that the star was interested in returning (see second and last pic – translation; “He is perhaps going to be sent into the air for a 5th time – he is being sought to star in ‘Superman: The New Movie‘) and production slated for Universal Studios in Florida, things were slowly falling into place. Tragically, however, by 1992 Warner Brothers were seeking to consolidate their ownership of the character and the Salkinds were ousted as WB eventually retained all rights. 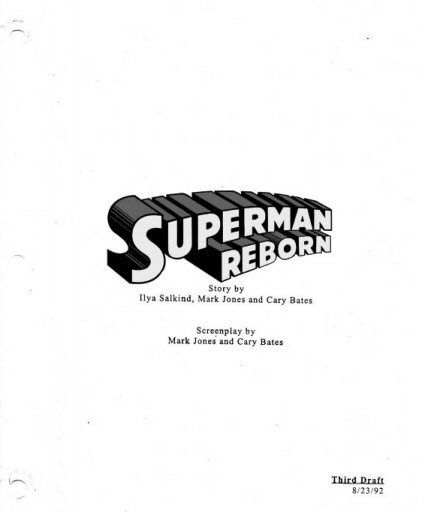 This meant that the third and final draft of the script (now entitled Superman Reborn – see top pic for script cover) would be shelved indefinitely while plans were made to have Superman return to the small screen. if only reeve had done a fifth movie in 1990 or so. Yes indeed, such a shame the series didn't finish on a high and fulfill its potential…Who knows what would have happened had Reeve still been with us…?